Every year we have poinsettias in chapel and every year they are beautiful. But this year...I know it's crazy, but they look more beautiful than ever: the reds look brighter, the whites seem clearer...they just look healthy and "happy"..if flowers can look happy. Ditto the orchids in my office. After hearing all my life that orchids are a special flower, that people who grow and watch over orchids are a special breed, and that orchid flower shows are unique in their own right, I never even entertained the idea of getting one, let alone caring for it. But that changed about 5 years ago when a sister received a beautiful orchid as a gift and, after the flowers fell off, didn't know what to do with it. "I'll take it" I chirped up, forgetting my previous thoughts. All I did, really, was put it in my office in indirect sunlight, yet lots of sunlight; talked to it, watched over it, and gave it the prescribed teaspoon of water a week. Life continued month after month after month until one day more than a year or so later I saw these odd long things growing out of it. Turned out they were roots (above ground) and after another while a stem appeared and finally flowers. It was absolutely beautiful and I was dumbstruck at the process and at the results. That was about 2-3 years ago and I've been watering, talking and watching over it yet again, not really giving it the attention that I do all the other flowers which seem to need more.....and voila, it's happened again: roots, stem and flower buds have appeared. Watch this space: I hope in the next few weeks to share its beauty with you. P.S. In another forgetful moment, I adopted a second gift-orchid a couple years ago and have given it the same treatment. Nothing happened...until two months ago: out come the roots and now I am watching diligently for a stem to appear! Ha--maybe I should look up when the next local orchid show is scheduled! We have a lighter number of overnight visitors these holiday weeks, but we do have one very special guest. From the Benedictine Sisters of Daegu, South Korea, Sister Xavieria is with us for the four-week break between semesters at the University of Dayton in Ohio where she is studying English. This is a lovely community of a couple hundred Benedictine women who run all levels of schools, including a college, as well as large hospitals. We have had two or three of these Sisters here, usually to improve their English. Xaveria comes for the same reason and is just delightful. We hope she comes for other "college breaks"! When snow comes, our animal neighbors come closer! Some Kris Kringle presents begin to accumulate under the Community Room tree. A holiday scene in a corner of a residence hall. A look at our snow-less backyard through a silver wreathe. I've been hearing lots of versions of Leonard Cohen's song Hallelujah. It is such a haunting, deeply spiritual song. Despite all the beautiful renditions my favorite is still the one sung by Cohen himself--here. As promised, Christmas decorations began to make their appearance today. This is one of my favorites. It's a huge wreath that goes up right at our switchboard/hospitality desk at the front door. A lovely welcoming to all of our holiday visitors. This year's chapel tree is a tall one. They are never perfect, but always beautiful My favorite was a "Charlie Brown" one whose branches were horizontal, enabling us to see the ceramic wall behind it easily. But, oh my, when the sunlight came through the south stained glass windows the reflections on those same tiles with evergreens boughs superimposed were a sight we've never seen since. Gorgeous. You can see it for yourself by going to the archive list in the right sidebar and going to 2011, the December 26th entry! And here's our "home" tree--the one we will decorate, put presents under and sit beside and just gaze, while sipping tea or hot chocolate. My friend who is a poet, finds wonderful poems that she shares on the blogs she manages. Here's her entry for this Advent. “My dear, they have dropped the knife. let alone the deer, if they were out in the open. With great sadness I realized that we are 1/2 way through Advent already. I haven't even heard every song in our Advent music booklet yet, in fact it may be an impossibility as there are 57 songs and only 23 days of Advent this year! Nonetheless, Kris Kringles are alive and well. Little gifts appear in mail boxes and shoppers get out to purchase their little package for the gift exchange Christmas Eve. Here are two Kris Kringle items that appeared in my hallway: a lovely vase of berries and greens and a Merry Christmas Advent calendar (isn't that an oxymoron?) with Peanuts characters! By this weekend Christmas will begin creeping in more and more.....slowly, slowly. Last evening we had the opportunity to attend an hour and a half "event" held in downtown Erie, a conversation with Chris Matthews, host of the MSNBC evening show "Hardball." Sure Cokie Roberts was here a couple years ago, and we heard Doris Kearns Goodwin last month as part of the same series, but generally these aren't an every week occurrence here, 350 miles from DC as we are. In contrast to his rather in-your-face interview/hosting style on TV, he was casual, warm, very funny, Catholic, Irish, and generally "a regular Philly guy" as Anne, a regular Philly gal herself, concluded. He shared his opinions and mostly his experience of years in the world of national politics and journalism. He was not overly judgmental nor overly critical. One of the memories I will have is that although he clearly admired some presidents and politicians more than others, he said that most of our presidents were a mixed bag...good and admirable things in all of them and the opposite, too. His latest book is about Bobby Kennedy who he thinks was quite the unique man and politician--and often the not-so-secret influence behind his brother's presidency. Beautiful, unique, special Advent moves into its second week. We haven't had snow in about a week....no complaints here, just the facts! Today we had the fluffy stuff, really light and really beautiful. Our winter-long commitment to our bird population is strong. Here is how pretty the feeders looked, just before a refilling this afternoon! Thanks to recently acquired gift certificates we took in lunch at a new-to-us restaurant, the Brewereie. 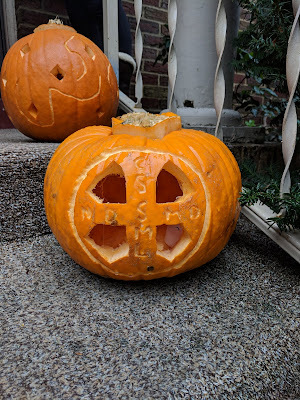 Located in the old Union Station at 14th and Peach, I was overwhelmed when we opened the front door: "Oh, I wish my Dad could see this" I said out loud. In fact, I wish all old-timer Erieites who remember the station as a busy train hub, could see it now. WOW! We sat in one of the "booths"--really old waiting room high-backed wooden benches and then walked all around while we awaited our soup and salad lunch--which was delicious. Oozing with natural atmosphere, it is a wonderful nostalgic trip a few decades back when passenger trains came through towns like Erie on a daily basis and were one of the primary modes of transportation. If you live in Erie or visit it regularly I encourage you to give it a try (it's open for lunch, dinner and its famous beers every day). Enjoy! 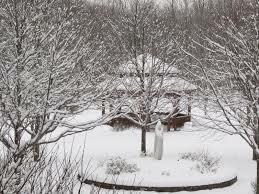 Our second--rather mini--snowstorm came along earlier this week and it reminded me that it would be a good time to share one of my favorite winter photos again: St. Scholastica and the courtyard gazebo, taken from a second floor balcony. Winter is a time for many things that just don't fit quite as well in the other seasons. One of these for me is reading. Michelle Obama's book, Becoming, is making the rounds here, as is Bob Woodward's Fear. 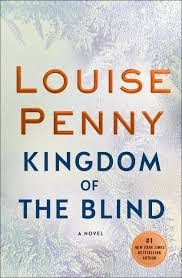 Yesterday I received a surprise in the mail, Louise Penny's brand new book, Kingdom of the Blind. There was no note to indicate the sender--perhaps I have a secret admirer!! Anyway, eat your hearts out you Armand Gamache lovers. He's off on another adventure in Three Pines and Montreal, wonderfully described and shared in Penny's outstanding writing. I'll have to read it rather promptly in order to then donate it to the library. I hear the waiting list is really long! For the fourth or fifth year in a row, we've hosted the Christmas special dress rehearsal for the local singing group extraordinaire, Tennessee Back Porch. This weekend was no exception in their presentation of a unique holiday event. Many sisters and friends took in the two-hour show in our chapel and marveled once again at the vocal quality of lead singer Julie Moore and, now, her daughter Becca. The accompanying musicians are also excellent in their own areas. A wonderful, wonderful performance all around. They present their "Follow the Star" program a number of times in the area. If you're local, you should give it a try. It's great! Tennessee Back Porch's website. P.S. Who was that mystery guest oboist on that one song? Our bird feeders are busy these days as the natural food sources for our many birds dwindle. This weekend we will have an unusual group of visitors--high school sophomores! They are being brought here by their theology teacher who was part of the Joan Chittister Institute for Contemporary Spirituality this summer--held for millennials with degrees in theology/religious education. We get lots of college-age students, but not high schoolers as a rule. Their upcoming visit has put me in a nostalgic mood for my high school teaching days. Here's one of my memorable moments from my first or second year as a teacher. I was in the original habit and was being overly animated in an Algebra II class one day. My arms were flying around trying, I guess, to make an exciting algebra point or trying to get or keep their interest. On the teacher's desk in front of me was one of those classic plaster of paris statues of the Blessed Mother. In one particularly excited gesture my wide swaying sleeve hit that statue and sent it flying the length of the room (luckily right down an aisle) smashing the whole way, sending shards of blue and white everywhere. Of course this brought total silence to everyone--as 35 pairs of 16-year-old eyes turned to me--too stunned to even blink. Luckily I was still young and, as I said, very excited about being in a classroom. Once the statue came to a stop I just burst out laughing, which of course allowed them to join me! Want to bet that's the only thing some of them remember from their algebra II class! I'm sure I will continue to be flooded with memories throughout this weekend. How nice! Our weekend snow is gone but it was really beautiful while it was here. Oops! White metal summer furniture didn't get put away in time! They're still white, but with snow now. Autumn berries were caught in our first snow. They make great photo ops. Our little chickadees are faithful visitors to our feeders--all winter. We are fortunate in Erie to have three lighthouses. Two are on Presque Isle State Park: The Presque Isle Lighthouse, whose light reaches out into the lake, and the North Pier Lighthouse whose light is at the entrance to the channel that leads from the lake into Presque Isle Bay. The third one was recently restored (2004), though it doesn't have a working light, and is the Land Lighthouse, located along the shoreline in east Erie about 5 miles from us. It was first built as a wooden structure, then rebuilt out of brick and finally rebuilt with sandstone. All of these took place in the 1800s. An Open House this weekend at the Land Lighthouse enabled us to climb the spiral staircase to the top. It was quite a feat. Here's the view looking down at the historical story boards on the grounds. That's Lake Erie at the top of the photo. Here's the renovation of the sandstone structure. It really is lovely, very "historic" looking and has garnered quite a number of local history buffs so that it will never fall into disrepair again! from the children of St. Benedict's Child Development Center. The best place in town! Delightful October community weekend which included a "home" visit by 100+ of our obates--lots of "old timers" and quite a number of new ones. One initiate was greeted by the sign "Better (ob)late than never," given to her by a friend with a not-so-veiled comment on how long it took her to decide on it! Photo and carving courtesy of Erin C.
Were pumpkins even a thing in 6th century Italy???? Maybe just yet another example of how the life is evolving through time and culture! The Erie Intermodal Transportation Center was the site this week of BFP's monthly Silent Walk For Peace. Entering its second year already, this 30-minute public demonstration for peaceful hearts, peaceful cities, peaceful countries and a peaceful world is held at various venues around Erie. This month the place was downtown right along the bay front where there are a variety of city offices as well as the hub for Erie City buses and Greyhound buses as they come into and go out of the city. The reality of border patrol agents monitoring the Greyhounds for possible immigrants to question is what drew us there to pray for peace. Watch our community website for a reminder of November's walk on Thursday the 8th at 10th and Sassafras Sts. By 7:00 pm the sun has just about set in our part of the country in late October. The only light available for these shots was artificial but I thought it would be worth a try. The Russian Orthodox church on the cliffs above the Bayfront Highway. The side wall of windows in our main library branch, with the masts of the Flagship Niagara in the background. A large Great Lakes freighter in port. This week the 2018 tour of Nuns on the Bus, sponsored by the Catholic lobby, Network, will come through Erie, on the way to its final destination, Mar-a-Lago Florida. From their literature: "NETWORK's Nuns on the Bus is hitting the road—for the first time in two years! This time, Nuns on the Bus: the Tax Justice Truth Tour is traveling from California to Florida ahead of the 2018 midterms to focus on tax justice and reasonable revenue for responsible programs. Throughout the journey, Sister Simone Campbell will be joined by 30 other Catholic sisters for the 21-state tour that will end with a Fiesta for the Common Good." Our prioress, Sister Anne, has been asked to be part of the program at our downtown Perry Square at the Rally in Erie. As we hit the mid-October point there is a "closing up of the house" feel to the days now. Our central air is off and heat is on; cardigan sweaters are beginning to make their appearance--even some sweatshirts and long sleeved tops show up in chapel each morning; the feel of fresh air coming in from open windows is gone--replaced by that closed door feeling; the first sinus infections and stuffy noses can be heard; we are awash in apples in every conceivable manner our cooks can think of; the trick or treating hours for the city and surrounding townships were in the paper yesterday and more people seem to be taking soup at lunch! All of these come with the cool mornings, intermittent daily rain and the newspaper announcement that our trees will be at their peak autumn colors this week! The number of visitors has not changed yet. The guest list that we post weekly was as long Friday as ever. Maybe they are getting in their last car trip before the roads turned "iffy" on any given winter weekend. I knew that Mary Oliver had won the Pulitzer Prize in poetry for her book, American Primitive but I had never read it or even seen a copy. Lo and behold I now own one. Also this week, down on the Glinodo side of our property, near the Eagle Scout built boardwalk, and under a grove of very tall pine trees we spotted a whole family of mushrooms. The damp, cool nights of fall are mushroom time for us and they are sprouting all through our woods and under trees such as these. Here's a Pulitzer Prize piece, along with our own entries to fall's delights. This week I was standing under a large, old maple tree waiting for a ride to pick me up and I was just looking around. At one point I looked up and this is what I saw. Pretty nice, huh? The days of cool in the morning, warm in the afternoon and a rain shower thrown in whenever it wants continue. We have lots of visitors still--some for overnight stays, others just passing through in the daytime. One man, who owns a small art gallery in a town down in Pennsylvania, came all the way up to Erie because he heard there was a collection of Brother Thomas's pottery here. He was delightful and quite complimentary about our collection--as well as being amazed. We get such a variety of visitors. One sister says, "It seems as if the whole world comes through Erie and the Mount at one time or other!" I agree. Thank you, John Wesley. We are into Methodists these days. For a number of years we have had a group of 12-15 Methodist pastors/church personnel with us for 3-4 days for their annual "retreat"....I think it's more a planning gathering, but I'm sure that there is prayer involved, too. They are delightful, every year a little more at ease and we really look forward to having them, (about 2/3 male, 1/3 female). Now, what happened last week? we had a group of Methodist women here for retreat! They were even more at ease, friendly and even came to our prayer. Delightful again! On the southeast side of Erie, when you reach Bird Dr. you leave the city limits to enter the little borough of Wesleyville--yes, originally a settlement of primarily Methodists--now totally heterogeneous, of course----even to the extent of holding their gatherings at a Catholic monastery. What is this world world coming to?!!! On the same note of common Christianity, on our trip to New York State this weekend we passed this darling little "church," actually a Mennonite place. Very small, sort of like a wayside chapel. I knew we had Mennonite or Amish nearby, but I had never noticed this little place before: Still Waters. This weekend a trip 20 miles east took us past all the small towns and fields that are into early autumn activities. One little township was having its annual Wine Festival and it was packed with tents of vendors and visitors galore. Every few miles we'd pass a roadside stand full of pumpkins, squash, tomatoes, zucchini and eggplant. Very Norman Rockwell-ish. The highlight, however, was the grape fields that were being harvested right as we passed by. If you've never seen a grape harvesting machine you should, it's really something. Kind of like a giant letter U, upside down, on wheels, with a cab on the top. The driver rides right over a long row of grape vines and the harvesting begins. Finally, our presider at Sunday Mass gave a wonderful reflection on "entitlement," a contemporary topic for the readings of the day. He proposed four areas that should be part of our own entitlement awareness: a) it should force us to do some real soul-searching; b) prayer should be a part of our considerations; 3) we must adopt "speaking truth to power" as a personal commitment and 4) politically speaking, we must vote and exercise our responsibility as citizens. Serious subject, wonderful reflections.